The shooting in Parkland sparked a series of changes, including a new law called the Marjory Stoneman Douglas Safety Act to make schools safer. NBC 6 Investigator Myriam Masihy shares a mother's perspective of living with a child accused of making a school threat. The shooting in Parkland led to a series of changes, including new Florida laws. In an effort to make schools safer, state lawmakers passed the Marjory Stoneman Douglas High School Public Safety Act, three weeks after the massacre. The law placed restrictions on guns and made school threats a second-degree felony. Since Parkland, there have been hundreds of threats made against local schools, some resulting in arrests. Last October, police arrested a student at Franklin Academy in Pembroke Pines for posting a photo of another young man holding an air gun. The same month, a nine-year old was arrested for bringing a gun to his elementary school. Earlier this week, two students from Southwood Middle were arrested for threatening to shoot a teacher and her children on the Parkland’s anniversary. NBC6 Investigators spoke exclusively with the mother of a 16-year-old who’s been accused of making threats in the past. We will refer to her as Gloria. “He told me like several times that he would kill me with a knife,” she said. According to police records, Gloria contacted the Broward Sheriff’s Office at least five times last year, accusing her son of stealing her credit card information, running away from home, and plotting to hurt his family. Last July, the mother went to the BSO’s station in Oakland Park after her son allegedly threatened to kill her during an argument. A month later, BSO and Child Protective Services went to the family’s home following reports that her son was using illegal drugs and skipping school. During an interview with an investigator, his younger brother said he was constantly getting beaten up by his brother. The teen was eventually sent to a rehabilitation center for troubled youth. A therapist, who had multiple counseling sessions with him, said his thoughts resembled the Stoneman Douglas shooter because he showed no remorse about his behavior. But that intervention didn’t stop him, according to court records. “I was scared that he could do something with those guns,” Gloria said. The teen told a BSO deputy that he borrowed the guns from an older friend. He went on to say that he had no intention to use them against people or bringing them to school. While BSO didn’t find probable cause to charge him with a crime, they took him into custody under the Florida Baker Act - after they determined that he was an “immediate danger” to himself. They also used Florida’s new red flag law to prevent him from buying firearms; something that the MSD law made possible. “The MSD law has helped us a lot,” said BSO’s Captain Mike Riggio, who leads the department’s threat assessment unit. “It has allowed us to identify people earlier. It allowed us to arrest people….to prevent people from legally purchasing firearms,” he said. Riggio said that there have been an increase in school threats and arrests since Parkland. “That’s a combination of things because now everyone at the schools, the principal, the teachers, other students themselves are seeing activity and they are reporting it,” he said. Last Summer, the department launched the SaferWatch mobile app, which gives users another way to report threats and suspicious activity. There were more than 600 threats made against Broward schools in 2018. That’s more than the two previous years combined. According to BSO’s data, there were 691 threats made against the county’s schools last year. That’s more than the two previous years combined. 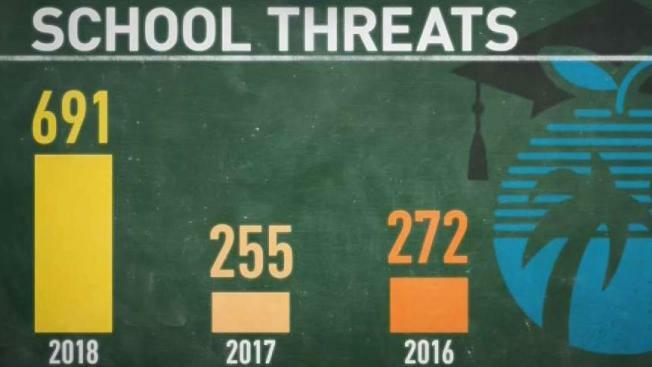 There were 255 school threats in 2017 and 272 in 2016. Miami-Dade Public Schools said they have received 59 school threats since the beginning of the 2018-19 school year. At least 12 students have been arrested for making threats since. “Any and all threats will be thoroughly investigated, and perpetrators will be prosecuted to the full extent of the law,” wrote Superintendent Alberto Carvalho in a news release. “It can lead to an arrest and a felony record. This is not something worth risking your freedom and your future over,” he added. The district didn’t keep a count of threats at the county schools before Parkland. Gloria says her son was never arrested. He’s back to his school and into her house. She says her son is going to therapy but it isn’t working. The Broward Sheriff’s Office didn’t comment on Gloria’s case but told us that there are limitations to what they can do and that an arrest is not always the right course of action.